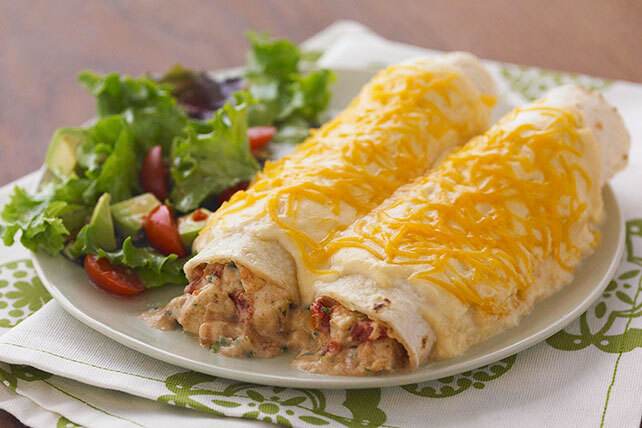 Cheddar cheese, salsa and chicken chunks are rolled into tortillas and baked to zesty perfection in this better-for-you version of a crowd favorite. Whisk dressing and flour in medium saucepan until blended. Gradually stir in milk. Bring to boil on medium heat, stirring constantly; cook and stir until thickened. Add 1 cup cheese; cook until melted, stirring constantly. Reserve 1 cup sauce. To easily chop fresh leafy herbs, such as cilantro, parsley, basil, mint and sage, pick the leaves from the stems and place on a cutting board. Using a chef's knife and holding the tip end down, cut back and forth across the herbs. Be sure that your knife is sharp - a dull knife will bruise the leaves. Use the herbs as soon as possible after chopping.